Fave lips and tips from Yves Rocher Summer 2014 collection - with swatches! 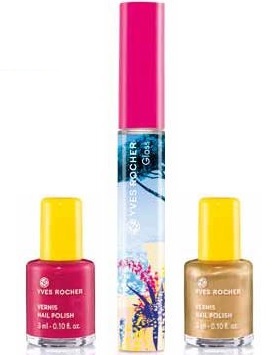 If you're looking for a bright and metallic summer vibe then check out the Yves Rocher summer 2014 collection! Bright Pink Gloss - like it wasn't enough that it's shiny and pink - but the raspberry extract also makes it smell wonderful! Bright Pink Nail Polish - the best thing about these polishes is that they come in such tiny bottles that you never have time to get sick of the colour before it's all gone!